Dr. Wei’s patients are well-acquainted with this Midtown Manhattan dentist’s perfectionism. Whether placing customized porcelain veneers or conducting a professional teeth-whitening treatment, Dr. Wei’s work is meticulous and thorough. 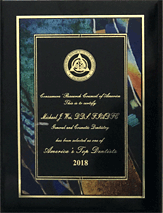 He is a top New York dentist because he has earned the distinction, not only through his daily work but in his pursuit of professional advancement. The fields of cosmetic dentistry and restorative dentistry are regularly filled with innovations in materials and procedures. 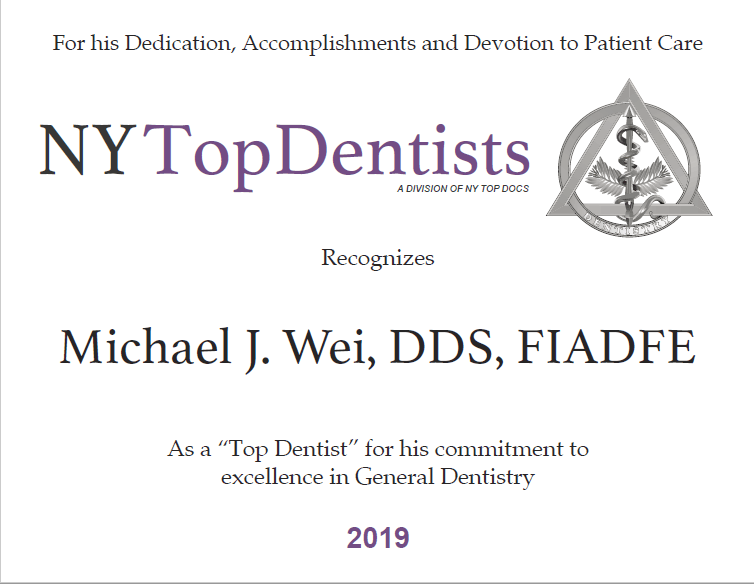 Dr. Wei serves his patients by enlightening himself and receiving special training on any beneficial advancements, which is why several times a year Dr. Wei pursues advanced dental education. He completes continuing education courses and trainings at top dental institutes, such as The Rosenthal Institute for Aesthetic Dentistry in New York and the Las Vegas Institute. 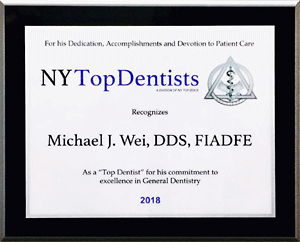 Dr. Wei is a member of the New York State Dental Association, the New York County Dental Society, the American Dental Association, and the American Academy of Cosmetic Dentistry. He has practiced cosmetic dentistry, general dentistry, and restorative dentistry from his Midtown Manhattan location since 2007. Excellent patient care consists not only of quality dental care, but also a wide range of carefully performed procedures. Dr Wei is focused on providing the dentistry that each patient needs individually, whether that’s a general cleaning or periodontal treatment, tooth-colored fillings or cosmetic bonding, Cerinate Lumineers or dental implants. Smile makeovers – The smile you want, created with a customized plan. Porcelain veneers – Your ticket to a celeb-worthy smile. Porcelain tooth crowns – The versatile solution to multiple tooth problems. Dental implants – The most secure replacement for missing teeth. Tooth-colored fillings – No one ever needs to know you had a cavity. Cerinate Lumineers – The non-invasive version of porcelain veneers. Dr. Wei is focused on patient comfort and satisfaction. He offers sedation dentistry to make it easier for multiple procedures to be completed in one appointment, and to ease the anxiety of particularly nervous or apprehensive patients. Find out why Dr. Wei is a New York top dentist and has been for over 17 years. He is ready to help you, no matter what your oral health concerns, no matter who you are. Schedule your consultation and get on the road to a new smile, created by an accomplished Midtown Manhattan dentist.